We drove down a country road until it ended at a single track lane. We proceeded slowly up the lane, pulling off at one point to allow a car to pass us as it came down. Finally we arrived at our destination, the Ironhorse winery, perched on top of a hill, surrounded by vineyards with a view across green hills. There was no fancy tasting room, just a collection of rustic, functional, barns. One of these buildings had a covered bar area which was open to the aforementioned views. The bar-top was rough wood. The apparent simplicity of this is in sharp contrast to the quality of the wines. 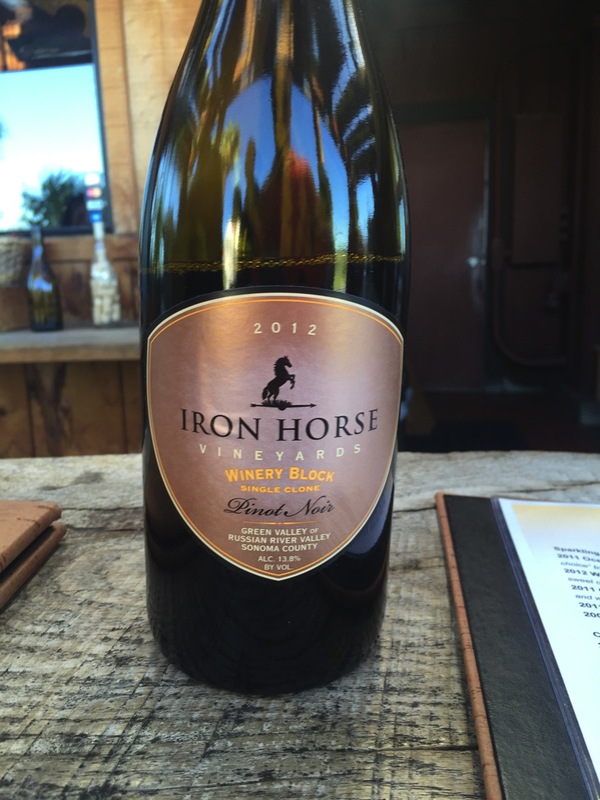 Ironhorse grows two grape varietals: Pinot Noir and Chardonnay. In addition to making single varietal wines, it has a range of sparkling wines. We tasted these sparkling wines and the Pinot Noir; the Chardonnay will need to wait for a future visit. Our server John was knowledgable, friendly, and attentive to us and the other guests. 2011 Ocean Reserve: This is their Blanc de Blanc, made for 100% Chardonnay. It sells for $50 a bottle. There were notes of lemon and had a sharp acidity and strong effervesce. 2012 Wedding Cuvée: This is a blend of 78% Pinot Noir and 22% Chardonnay. It sells for $44 a bottle. Fruit and earth on the nose. Dry, but not to the detriment of the flavour. It was first made for the wedding of the owner’s daughter, hence its name. 2011 Classic Vintage Brut: It sells for $42 a bottle. There was a nose of yeast, which fortunately was not reflected in the taste. A pleasant acidity balanced with strong hints of apple. This was my favourite of the tasting and we purchased a brace of bottles. 2011 Brut X: It sells for $50 a bottle. This is 74% Pinot Noir and 26% Chardonnay. The wine is a extra-brut and the driest wine we tasted. The flavour is reminiscent of a mineral water like San Pellegrino, with underlying addition of fruit. 2011 Russian Cuvée : The sweetest sparkling wine that they make. However, it is important to emphasize that all of their wines are on the dry-side, even this one is at most a Sec. This wine was first made for a 1985 summit meeting between Gorbachev and Reagan in Geneva. John told us that the winery likes to claim that this wine helped end the cold-war. The wine had a smooth spiciness, with a touch of yeast and a hint of strawberries. It sells for $42 a bottle. 2008 Rose: Surprisingly dark for a rose; it spends seven days in contact with the skins of the grapes, from which it gets its colour. I detected metal on the nose. It was extremely dry, possibly because of the previous two tastes, but had a complex floral palate. I started with 2012 Hope Block. There was pepper and tobacco on the nose, whilst the taste was soft with low acidity. My notes on the tasting say it was “Amazing”, but I retract that assessment, for reasons that will become clear. 2012 Winery Block Pinot Noir: There was an acidity on the nose; a more traditional Pinot Noir smell. The flavour was less complex that the previous one, with greater acidity and light pepper tones. 2013 North Block: It presented spicy, floral odors on the nose. The flavour was a beautifully balanced sweet fruitless that surpassed the first Pinot and left me putting “Amazing Plus” in my notes. This was my favourite. 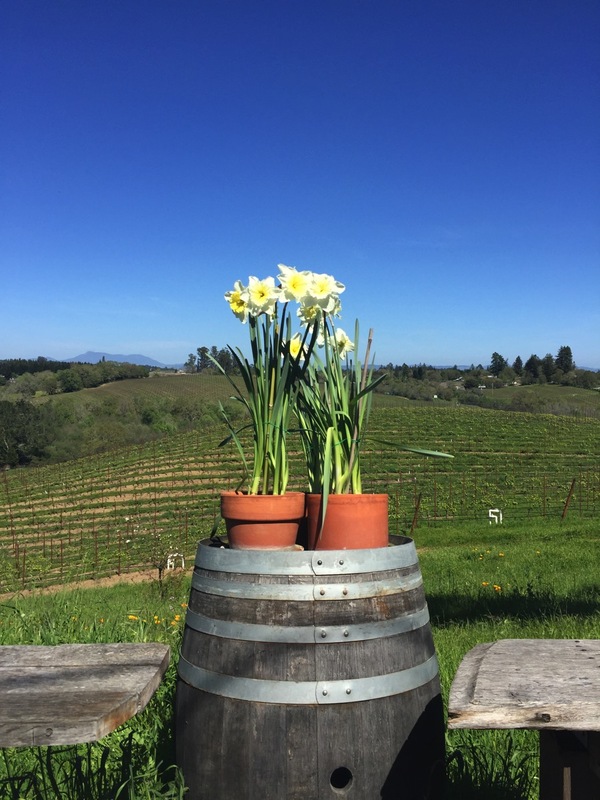 2013 Thomas Road Pinot Noir: A classic Pinot nose with rich earthy tones. It had more acidity on the tongue than the North or Hope Block wines; but left a beautiful berry aftertaste. There are three big sparkling wineries in Napa Valley owned by famous French Champagne houses; Mumm, Domaine Chandon, and Domaine Carneros. 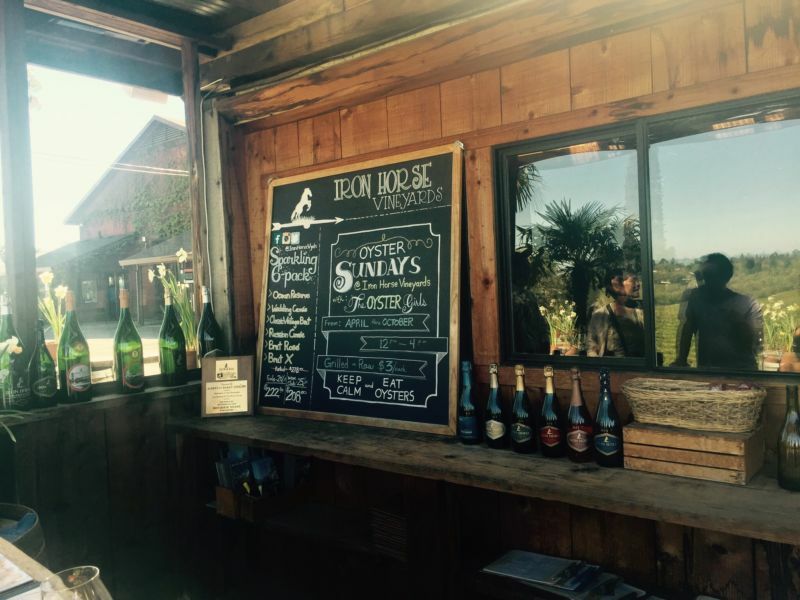 All three have tasting rooms that are larger and more impressive than Ironhorse. 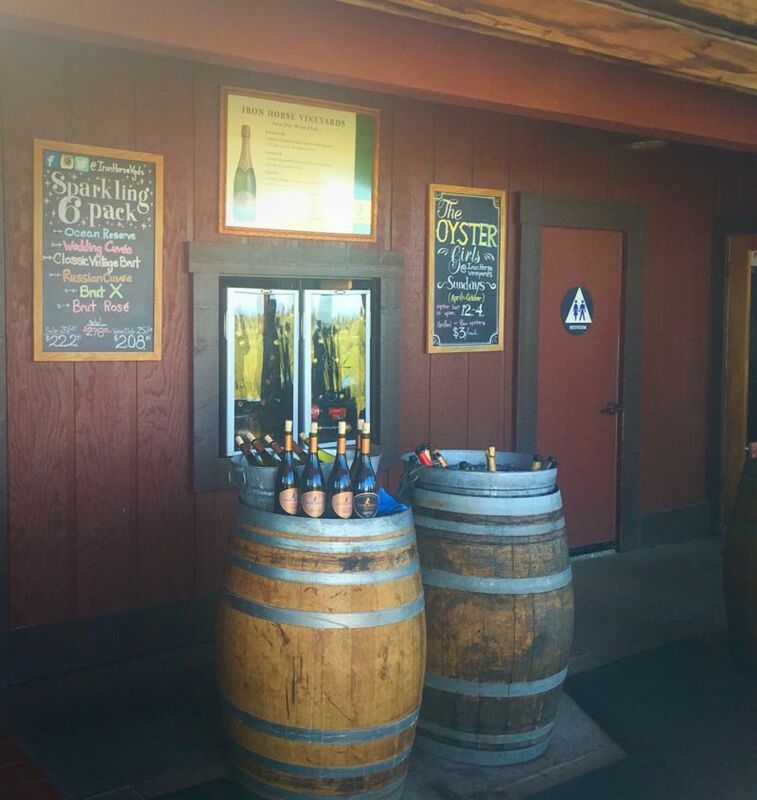 However, only Domaine Carneros makes sparkling wines that rival the quality and variety demonstrated by those served at Ironhorse. The Pinot Noir tasting surpasses that offered at Domaine Carneros.